The Robot Devil with his gold violin (1ACV09). The Robot Devil (also referred to as Beelzebot) is the dark lord of Robot Hell, where robots of Robotology are sent after having sinned. As the ruler of Robot Hell, he spends most of his time dishing out ironic punishments and gambling with souls. It is unknown when or why the Robot Devil was built. He was likely built before or around 2275, when the Fairness in Hell Act was signed into law. He is a member of the Church of Robotology, punishing those who sin against the teachings of the Church for eternity (1ACV09). At some point in his life he came across Calculon. He made a deal giving Calculon acting ability, and collected on that deal in 3004 when he took his ears (4ACV18). He has a holiday home in Hell's Kitchen in New New York that he bought from Kathie Lee Gifford's head some time ago. He was also once a member of Mrs. Mellonger's holophonor class. When Bender sinned against the Church, the Robot Devil collected him and prepared a series of agonizing, ironic punishments (1ACV09). 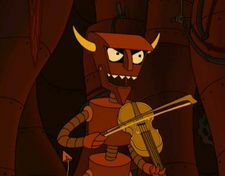 Fry and Leela found Bender in Robot Hell and challenged the Robot Devil to a fiddle contest after he informed them of the Fairness in Hell Act. He began by playing a bit of Antonio Bazzini's "La Ronde des Lutins" - in response, the duo beat him over the head with his gold fiddle and escaped, much to his chagrin. By Xmas Eve 3002, he had been arrested and spent time in a New New York prison (3ACV03). He was released in time for the Big Robot Party, where he was to be destroyed along with every other Robot on Earth (4ACV08). After he and the other Robots moved the Earth by collectively venting their exhaust, he returned to Robot Hell and continued to practice his music with his Robot Demons until Fry and Bender showed up again. Fry wanted new hands so he could play the holophonor without practicing, and the Robot Devil made a deal to give him the hands of any robot on the Wheel of Robots (4ACV18). However, the Wheel landed on him and he agreed to give Fry his hands. He came to regret that decision and set in motion a convoluted plan to regain his hands, culminating in an elaborate, impromptu song during Fry's opera. After threatening to marry Leela, Fry agreed to give his hands back and the Robot Devil returned to Hell to play a poker game with President Nixon. He loaned himself and his band out for the Turanga-Fillmore wedding in 3007 (5ACV03), possibly because he knew it would end in tragedy. After the universe started dating Yivo, Bender approached the Robot Devil about gaining a "damned army" to take over the world. He agreed on the condition that Bender surrender his first born son, but to his surprise Bender eagerly agreed (5ACV04). Later, the Robot Devil attended the violet dwarf star implosion but instead witnessed the birth of the Last Encyclopod along with everyone in attendance (5ACV16). He later attended Bender's 100th Delivery Party (6ACV12) and the wedding of Donbot's older daughter (6ACV14). After Bender was killed by Lynn and became a ghost, the Robot Devil made yet another deal with Bender saying that if Bender killed Fry then he would be restored to his old body (in retaliation for Fry taking his hands) (6ACV19). But Bender eventually decided that he couldn't kill Fry and would rather spend eternity in Hell. Bender took over and managed to destroy the Robot Devil's body, and after their ghosts returned to Earth the Robot Devil took over one of his replacement bodies. But he did not get to keep Bender since Bender was saved by Robot God. The Robot Devil possesses many unusual abilities. He can summon fire at will and can cause it to appear in his hand or on his finger (1ACV09, 6ACV19). He is also shown to be strong, as he ripped Bender's arm off with a tug of his wrist. He is also an accomplished singer and can play a solid gold violin without any trouble (1ACV09). He is also allowed to murder humans in his bargains, as when Leela agreed to let Fry be killed if she lost the fiddle contest (1ACV09). He also has several abilities which seem almost mystical. He can cause a pen to appear in his hand out of thin air, and is the only thing other than Robot God that can see robot ghosts. He has also shown some control over Robot Hell, causing flames to burst up from the ground (6ACV19). He can also swap hands with anyone by doing a quick move (4ACV18) and is one of only two robots who can free a robot ghost from Limbo (6ACV19). Despite his image as an evil lord, he has a very high pitched scream which manifests when he is in pain (1ACV09), and he considers Bender to be even more brutal than he is (5ACV04). The Robot Devil is played by Dan Castellaneta, most known as the voice of Homer on The Simpsons, in all his appearances except for "A Tale of Two Santas", in which Castellaneta wasn't available so that Maurice LaMarche instead did the voice. Castellaneta modeled the Robot Devil's voice after Hans Conried, a character actor and voice actor whose credits include Captain Hook in Disney's Peter Pan and Snidley Whiplash in Dudley Do-Right. There is a collectible toy of the Robot Devil, featured in the Toynami Futurama series 1 to 3 as a build-a-bot. The Robot Devil in his first appearance (1ACV09). Robot Hell, where the Robot Devil lives (1ACV09). The Robot Devil with his band of Robot Demons (6ACV19). The Robot Devil offers Bender one of his infamous deals (6ACV19). In June 3011, the Robot Devil told Bender's ghost (6ACV19) that he and Fry "once traded hands" (4ACV18) and that his still stank "of candy corn". After possessing his new body, after his old one was destroyed by Bender's ghost while saving Fry, his fingers changed from a claw-like appearance to a cylinder-like appearance more typical of Futurama robots. Since all of his replacement body's fingers were not claw-like, it's possible that he sharpened them on his own. Despite being the actual (robot) devil, he is surprisingly faint-hearted and skittish. In his debut, Hell is Other Robots, Robit Devil seems to be quite a bit larger than in subsequent appearances. He originally appears to be quite a bit taller than Fry or Leela, but later he seems to be around their or Bender's height. Bender: Aw, hell- I mean, heck. Robot Devil: 'Salright, you can say that here. Prisoner: [To Bender disguised as Robot Santa.] Hey Robot Santa, when you see the Robot Devil... tell 'im I'm'a comin'! Robot Devil: I HEARD him! Robot Devil: Can I have my hands back? Robot Devil: You're not nice! Robot Devil: You can't just have your characters announce how they feel... that makes me feel ANGRY! Robot Devil: Wow, that was brutal even by MY standards! Bender's ghost: So what's happenin' to me? And I'll take my answer in ANY form but a song! Robot Devil: [Already set up for a showstopping number.] Oh, you're no fun! Robot Devil: That's the laughy part! Robot Devil: Oh, God! Haven't they suffered enough?! ^ DVD commentary for "Hell Is Other Robots". This page was last edited on 21 November 2017, at 00:45.